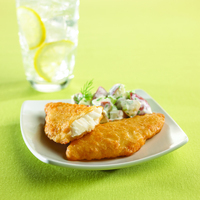 In the traditional manner of English Pub recipes, we hand-fillet 100% natural, untreated, whole muscle fish; and coat them with a crisp, savory batter made using robust-flavored, Samuel Adams Boston Lager®*.Available on premium snow-white halibut, moist and mild cod, or light, mild flavor tilapia. *Samuel Adams® Boston Lager is a registered trademark of The Boston Beer Company. Keep frozen until ready to use. Do not refreeze. Deep FRYINGer: Heat oil to 350F. Add produCT, shaking baskets occasionally to prevent from adhering. FRYING for approximately 4.5-5 minutes or until golden brown.